The Souveneers are going to loosen the crowd up. Their american-folk with a some rockabilly flair will be a perfect way to fire the evening up. They are preparing to record their first EP soon and are playing new material all the time. Scruffy & The Janitors don’t get to play often now so they are sure to let loose. Their first album Pino is little more than a distant memory for these ambitious youngsters. They have a ton of new songs in the bank ranging from garage rock to psych rock to just plain rump shakin’ groovy; expect them to bust out all of that and more. Missouri Homegrown is fresh off the release of their first album …You’re Gonna Get It and they are starting to venture in new directions now. As they pull songs from their past they have stopped playing and add new songs to the mix, look for a very different stage show than what you have grown accustomed to over the last year. 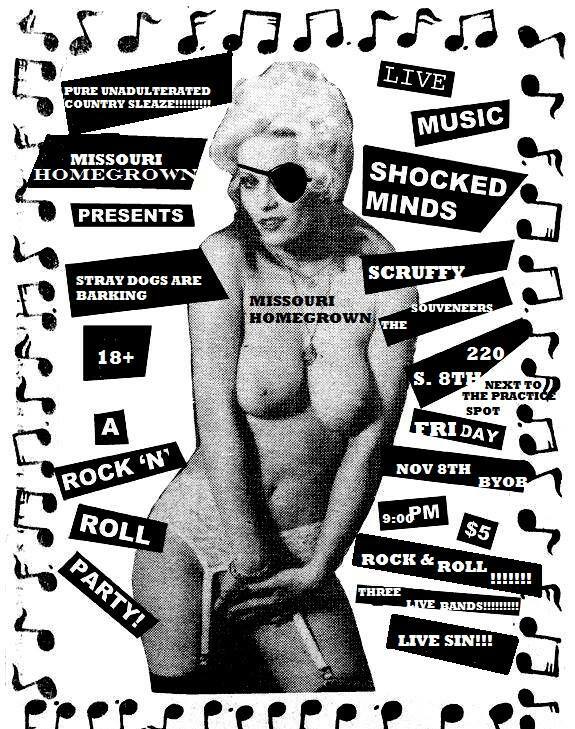 This entry was posted in Coming Soon and tagged Coming Soon, Headquarters, Missouri, Missouri Homegrown, Scruffy & The Janitors, Shocked Minds, Souveneers, St. Joseph, Stray Dogs. Bookmark the permalink.